Louisville VIP | Get A VIP Website & Get To The Top! Get A VIP Website & Get To The Top! Music, Contact Forms and others. We can give you many designs to choose from, then we will tweak that design base to fit your business. Your website will look amazing. We specialize in friendly support! We go the extra mile in explaining the web and all the services we offer in a way you can understand. No matter how well designed your website is, no one can find it unless it shows in searches, WE MAKE THAT HAPPEN WITH SEO! You always have access to your website’s content and design via the back-end admin user interface, where you can customize anytime. Louisville VIP can design your organization’s website with state of the art features. Our design team will build your company an attention grabbing website, professionally designed with state of the art software and search engine ready. We stand with you every step of the way while your site climbs the ladder to the top of the search engines. With Louisville VIP web solutions, your website will have all the features you want. We can install the latest & greatest to make your site look great and get seen on the internet. Features are our specialty. Louisville VIP has helped us many times with consulting about our web promotions. They continue to advise us on several projects including one that is currently ranking in the top 10 in Louisville websites. Rated Excellent in our book! Some are small, and some are enormous, Louisville VIP has made custom websites of all nature & sizes, We are very proud of each and every one we do. Although we do specialize in Louisville area web marketing, we have designed sites for businesses all over the country. Great website design is more than just eye candy. Louisville VIP uses a few simple points to ensure the best design possible. We make sure every website design is unique to the business it represents. We keep the design clean & clutter free – don’t make it hard to find your information. We do our homework – We find out what works your competitors and what doesn’t. We use visual hierarchy; this is where the eyes travel to convey your point. We use text that is easy to read – no fancy fonts making your site hard to read! We get your mobile site sorted out – Smart Phones and tablet visitors just increase over time. 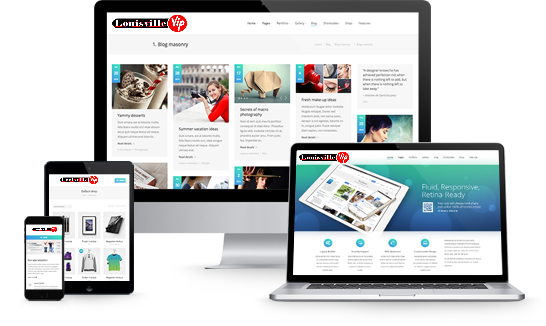 Louisville VIP has an experienced team will listen and discuss with your business goals so as to offer website design that is either a customized or template based solution that is scalable to fit your business. Let’s sit down and talk! Search engine optimization has become one of the most sought after features in website design. But good SEO alone is not enough to keep your business pages ranked high. A website should consider all of the contributing factors from design to hosting and more. Louisville VIP is very knowledgeable in a broad range of SEO tactics designed specifically for websites. Louisville VIP will approach each and every project from a search engine point of view rather than a simple, quick design approach. So if Search Engine Optimization is something your company is after, let us design everything from the content to the images that are placed to the domain name you decide to purchase. All parts of your website should work flawlessly together as a whole. We keep the design code clean & clutter free. We’ll program your web page to make it easy to find your information. Louisville VIP can provide a full-service photography shot. We have team members that are professional photographers; we can send one to your place of business, or you’re welcome to send in your high resolution photos. Louisville VIP will get the right photos for your website to make the design stand out. Good photography can make the website pop. Together we can decide the photos to use that will showcase your business and fit in with the design and layout.